Daughter of the Hofmarschall (master of the ceremonies) at the court in Weimar. She was educated to be a lady in waiting and learned art, singing and dancing. In 1758 she became lady in waiting to Anna Amalia, the Duchess of Saxe-Weimar-Eisenach. She held this position until Anna's death in 1807. In 1864 she married Baron Gottlob Ernst Josias Friedrich Freiherr von Stein (1735-1793). It wasn't a love match and her husband often travelled. They had seven children between 1764 and 1773. In 1774 she met Goethe in Weimar. They became very close friends and Goethe wrote her love letters. It's not certain that they had a physical relationship as well, but they were very close for at least twelve years and she had a huge influance on his life and work. During this time she also befriended Friedrich Schiller. In 1786 an end came to their friendship when Goethe left for Italy without telling her. After his return he started a relationship with the young Christiane Vulpius. In 1793 she was widowed and in 1794 she wrote the drama "Dido", about her years in Weimar between 1770 and 1790. It wasn't until 1800 before relations between her and Goethe normalized and their old friendship never returned. 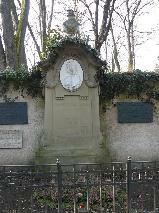 The grave of Charlotte von Stein at the Friedhof vor dem Frauentor, Weimar.